The Moonbase is the earliest Second Doctor story that can be reconstructed. His first two adventures, The Power of the Daleks and The Highlanders, have no surviving episodes and only some clips. The third Second Doctor story, The Underwater Menace, has only one complete episode. The Moonbase, a four-part story, has two complete episodes, and with the audio of Episodes One and Three you can build the entire story around the surviving material. Just like The Crusade, we therefore can reconstruct The Moonbase and review it as a complete story rather than as bits and pieces. While I hope that we will one day get an official reconstruction of The Moonbase, and while this story has the bonus of being the return of the Cybermen, The Moonbase itself falls a little short of expectations. The Doctor (Patrick Troughton), his Companions Ben (Michael Craze) and Polly (Annek Wills) and the Highlander Jamie McCrimmon (Fraser Hines), have landed on the Moon. The Companions want to explore the Moon, and the Doctor reluctantly agrees. Jamie is injured, but fortunately there is a base on the moon. Here, a group of scientists are controlling the Gravitron, which controls the weather on Earth. The moonbase is run by Hobson (Patrick Barr), who is highly suspicious of the new arrivals, but accepts them thinking that the Doctor is the doctor Earth is sending to try and find why so many of his crew are starting to fall ill.
Jamie is placed in sick bay and while there, continues to mutter about The Piper, threatening to take him to that big Highland in the sky. However, it's no Phantom Piper that menaces the moonbase; it's the Cybermen. 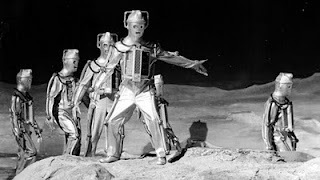 Believed destroyed in The Tenth Planet, they have somehow survived and now are attempting to take over the moonbase. One by one they are taking the crew: they have released a virus that makes them ill, then the Cybermen take a sick crewman one by one to "remake" him. Soon, the Doctor discovers what is making them ill and how the Cybermen have been entering the moonbase surreptitiously. Now, the Cybermen attack, determined to take the moonbase and kill all life on Earth (since the Gravitron on the moonbase controls the weather, it can create chaos on the surface). The Doctor defeats the Cybermen by manipulating the Gravitron, and the metal villains (along with their ships) literally float away. With that, the Doctor and his Companions quietly leave, and The Moonbase ends with our heroes seeing a gigantic claw on the monitor. It is a shame that The Moonbase doesn't exist complete. However, Kip Pedler's script starts out great and then slowly goes downhill, particularly in Episode Three. Some things are beyond his fault. During The Highlanders, it was decided that the character of Jamie would be part of the TARDIS crew, so he had to be written into the story. The way to include Mr. McCrimmon was to put him in sickbay for two episodes, which perhaps was the only way to work him in, but his constantly protests about the Phantom Piper started wearing a bit thin and were becoming almost funny. There were also some rather bizarre choices director Morris Barry made. For example, on the moonbase itself, the crew wore t-shirts with their respective country's flags on them. Perhaps this was a way to denote they were from various countries (although from the footage we only saw British, French, Norwegian, and Australian crew--not exactly a worldwide effort), but the effect is a little curious. One couldn't help think this was a cost-cutting effort. If that aspect of the costumes wasn't already strange, it was the caps the crew had to wear inside the central control of the Gravitron that was just silly: it looked like they were wearing shower caps made of foam. There was also some pretty awful acting in The Moonbase. Episode Four has what is suppose to be a terrifying assault by the Cybermen where the oxygen supply is cut off. The way everyone is 'gasping for air' is so totally fake and highly exaggerated. In Episode Two, when another crewman is taken ill, the acting is pretty lousy (if not laughable), but when the virus is seen to spread through his veins, that is a particularly effective, even frightening scene. This I think more than anything else shows the good and bad of The Moonbase: a good story ruined by some bad choices. One bad choice was in the voices of the Cybermen, not the actual voicework by Peter Hawkins, but in its use. At times, it was hard to fully understand what they were saying. This is more a growing pain for the Cybermen I imagine: their robotic voices would improve over time to where by their final appearance in the classic series (Silver Nemesis), they were intelligible. Side note: is it me, or are the Cybermen a lot like the Daleks? They are at least similar in this way: both have no emotions. Just a thought. In a more historic sense, The Moonbase shows the casual sexism of the 1960s. While Jamie and Ben are going around stopping the infected crew (controlled by the Cybermen) and the Cybermen themselves from taking the base, Polly is relegated to making the coffee and serving it to the crew. She also gets attacked by a Cyberman in Episode Two, but the next time we see her in the same episode she is perfectly fine. Watching The Moonbase now, it is hard to imagine someone like Sarah Jane Smith, let alone Rose Tyler or Amy Pond, doing nothing more than bringing coffee. Admittedly, times have changed, so it is unfair to judge The Moonbase by today's standards. However, it doesn't take away from seeing how a character is relegated to near-irrelevance. Finally, the actual resolution to the Cybermen assault appears so quickly and almost comic. A change in gravity has the Cybermen (along with their ships, which sadly you can see the strings on), just float away. Literally, just float off into space. To my mind, it appears a remarkably cheap and easy way to eliminate a threat that has been building for three episodes. There are good things within The Moonbase. The story itself is quite clever, and the actual Cybermen attack in Episode Four creates a strong sense of menace and danger. Troughton creates a great balance between serious drama and light comedy; he is trying to find the source of the virus but has had no luck. Hobson is continuously threatening to kick them out of the moonbase, and the Doctor bluffs his way to get Hobson to leave the sickbay where he's conducting his experiments. Here, Troughton shows his talent: he manages to sound serious to Hobson while quickly switching to slightly bumbling as soon as he leaves. There is still a strong rapport between Wills and Craze, an affection mixed with a mild dislike, somewhat like a brother and sister. Ben still refers to Polly as "Duchess" (mocking her more posh background to his Cockney roots) whenever he gets irritated with her questions, but it never appears to be said to spite her. Hines starts out very slow (because he has to wait for that Phantom Piper), but by the end he takes the action role of Jamie and makes it his own. It is unfortunate that with Hines' addition to the crew, the Companions often appeared to be secondary to the action rather than part of the story itself. This isn't any of their faults: Wills, Craze, and Hines work well together, but having so many people in such a small space makes it hard to give them individual moments. It has a inventive story that with a bigger budget and some changes could have made it stronger (like getting rid of the national t-shirts). Perhaps if the actual assault on the moonbase had been carried on longer, and we had more use of the unwitting Cybermen Fifth Column via the sick crewmen, The Moonbase could have been a real exercise in terror. Despite its incomplete status, The Moonbase is not one of the better Cyberman stories because of too many exterior aspects. It does have the benefit of bringing back one of the best Doctor Who villains, one that have become iconic and rival the Daleks in terms of popularity. However, the resolution doesn't work, the Companions are relegated to almost background players, and The Moonbase suffers from that. In the end, The Moonbase ends up a trifle cheesy.